Newsmax Health | Dr. Gary Small, M.D. Misplacing your keys, forgetting someone's name at a party, or coming home from the market without the most important item — these are just some of the many common memory slips we all experience from time to time. 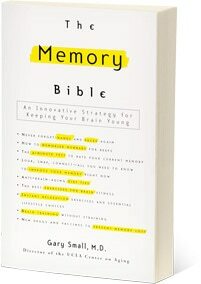 The international bestseller that provides pioneering brain-enhancement strategies, memory exercises, a healthy brain diet, and stress reduction tps for enhancing cognitive function and halting memory loss. 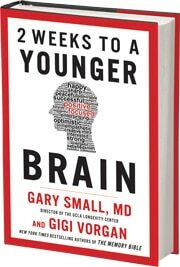 Dr. Gary Small, author of The Mind Health Report newsletter, is a professor of psychiatry and aging and director of the UCLA Longevity Center at the Semel Institute for Neuroscience and Human Behavior. Dr. Small, one the nations top brain health experts, frequently appears on The Today Show, Good Morning America, and The Dr. Oz Show. He is co-author with his wife Gigi Vorgan of many popular books, including The New York Times best-seller, The Memory Bible, and The Alzheimer’s Prevention Program. Let's face it — without a decent mind, you have no quality of life. With Dr. Gary Small's Mind Health Report, you'll gain greater health, happiness, and fulfillment in your relationships, personal life, work life or retirement, and more. Dr. Small fills every issue with the latest advancements in brain research from the far-reaching frontiers of neuroscience and psychiatry. You'll not only read about breakthrough techniques for rejuvenating your brain health, but also see actual case studies from Dr. Small, one of the nation's leading brain and aging experts and director of the UCLA Longevity Center. Each month, you'll embark on a new journey into the world of your brain. You'll discover the latest on topics such as Alzheimer's disease and memory loss, anxiety and depression, diet advice for a healthy brain, natural supplements and drugs that aid mental functioning and lessen pain and fatigue, and much more. Home | Gary Small, M.D. Obsessive-compulsive disorder (OCD) is a potentially debilitating condition that impairs a person’s ability to control recurring thoughts and urges to repeat certain behaviors. Many of these patients suffer from fears of germs, impulses to check locks and doors, and worries about aggressive outbursts. One form of psychotherapy that is effective for the condition is known as cognitive-behavioral therapy, or CBT, which teaches patients ways to resist their obsessions and reduce their compulsions. A UCLA study published in the journal Translational Psychiatry showed that OCD patients experience improved symptoms with CBT, and their brain scans demonstrated augmentation in the extent of the connections between several brain regions. Stronger connections between different brain regions often reflect more effective communication between cells within the brain.